Scott and Quang first heard about The Barker Adoption Foundation through an internet search. Being in their late 30s and 40s, they felt that adopting an older child through Project Wait No Longer would be a good fit for their family. Scott and Quang waited patiently during the searching process, and at about nine months they were matched with an 11-year-old boy. They were beyond excited about the possibility of being parents to this child. They met with the caseworker and shortly after were selected as adoptive parents for their son. A few weeks after the initial match, Scott and Quang had their first visit with their son. 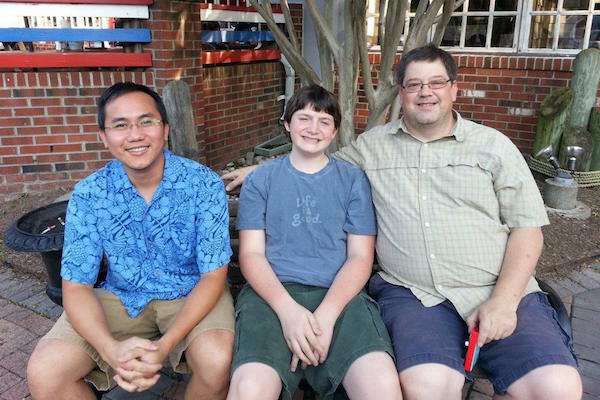 Scott shared that they “were nervous, scared, and excited at the same time.” The first meeting was “a bit awkward,” but after leaving Quang looked back and said, “I just adore that boy.” After several more visits, the placement was made and Cameron joined their family forever. Both Scott and Quang realized that the transition would be challenging, but they felt the preparation and support they’d received during the waiting period had equipped them to face those challenges.